Bentonville, AR – December 16, 2015 – Softscribe Inc., an award winning technology public relations firm based in Bentonville, AR, shares 3-steps hotel technology providers can take to increase sales and qualified referrals from social media channels. (1) When you distribute a news story, first post it on your company’s website. Do this immediately for linking purposes. This drives referrals back to your website, not back to distribution channel websites. Also, include a customer quote and link it back to your website. Post it again on social media using links from hotel channels that pick up the news. (2) Post the original, complete URL (from your website) on Facebook and LinkedIn. (3) For Twitter, use the URL shortener www.tinyURL.com. This way, you know any Google Analytics that use tinyURL are referred from your company’s Twitter page. (A) For Facebook, give it a more personal feel. Example: If your team does an install, have the team take a photo of the property. Tag the property “Thank you for having us.” Also, check your Facebook settings so people can tag you. Have employees “Like” your pages. (C) Congratulate customers for awards they win. Tag them on social media. 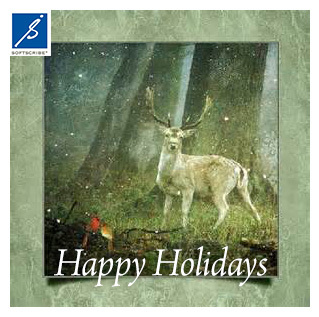 Facebook presence a personal feel, with a holiday visual image. Would you like more information on how to boost engagement and sales to the global hospitality market for your company’s technology solutions? Please give us a shout now at softscribe@softscribeinc.com or 404.256.5512. Softscribe Inc. is an award-winning technology PR firm that specializes in B2B public relations, branding and market consulting. We achieve significant business growth for tech companies that offer enterprise solutions to multiple markets. These industries include hospitality, casino gaming, multifamily and more. We generate the right messages for client audiences 100% of the time. This is essential to close sales. Softscribe Inc.’s stellar team surpasses your expectations with an average 18 years industry experience in branding, marketing and technology PR. We are proud of our best-in-class clients and are ready to help you, too. Please give us a shout now, or visit www.softscribeinc.com.